Commonly blamed for inventing that singularly pompous pose forever associated with his most famous subject out of some ridiculous depravity or artistic inadequacy, Jacques-Louis David, Napoleon Bonaparte’s portraitist, vigorously denied such charges not with dodges but with salvos of his own. The stint at Elba and consequent reconquest made him wary of St. Helena, even the grave—he dared not go against the Emperor’s word—and so, out of necessity, he had become skilled at sensing imperfections in others, refusing to keep his tongue when slandered. 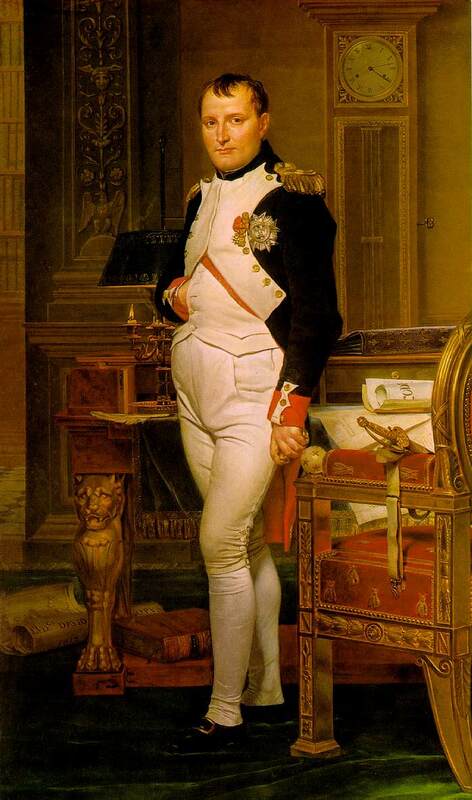 The 1812 canvas, Napoleon in His Study, is perhaps the most famous of these hand-in-waistcoat renderings, but, truth be told, all of David’s portraits of Napoleon I featured this pose. It was David’s peculiar misfortune to have been afflicted with such a stubborn subject in the first place.